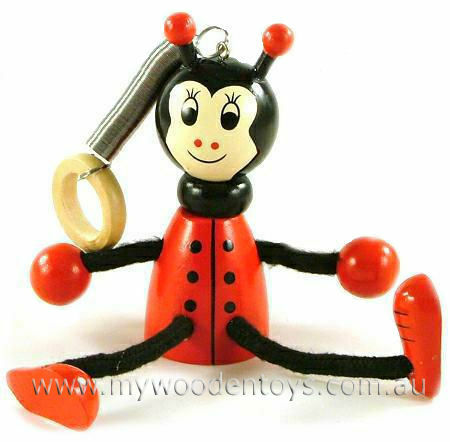 Bouncing Ladybird is a lovely happy toy with a beautiful shiny red body with black spots and a smiling face. Suspended on a long spring from a wooden ring this Ladybird has a pleasingly slow hypnotic bounce. Material: Wood, Metal Spring, Child -safe paint, Soft Rope arms and legs. Age: 3 + It can of course be suspended out of a younger child's or babies reach on a ceiling. We like this because: "It is lovely brightly coloured toy with a smiling face that bobs up and down happily on its spring ."